Depression is so common here. Few people are well aware of this entity & seeks early help. But most, like to live in agony & mental pain of depression. Nearly every tenth person in India runs the risk of developing an episode of depression during his lifetime, according to a study conducted by the World Health Organization. While experts in India reckon the threat, they caution that efforts to fight depression will remain futile unless social stigma and ignorance attached to it are removed. According to WHO prediction, depression is stated to become the second leading cause of disability & death across the world by 2020. Depression affects different age - groups at different points of time. The context, circumstance and the stress factors varies with age. Exam related stress among children is one of the major causes of depression. In youth, relationship issues and job related stress contributes to anxiety and depression. In the reproductive age - groups, marital conflict and infidelity acts as a major factor for getting depressed. In the old age, physical illness and neglect can be precipitating factor for depression. Depression can occur with or without manic phases. Both types of depressions (unipolar depression & depression associated with bipolar mood disorders) can be disabling, chronic with relapses, especially if they go untreated. There are effective treatments for depression. Depression can be reliably diagnosed and treated. 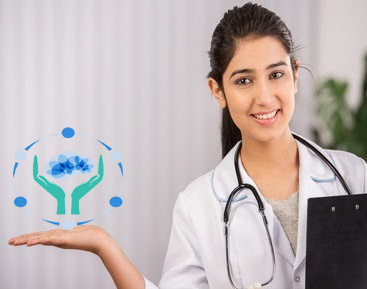 Apart from medicines, other complementary therapy include: cognitive therapies, marital therapies, counselling and stress management . Yoga and meditation are extremely useful complementary therapies for depression. If you are trying to cope amidst a chronic feeling of sad mood, physical tiredness or extreme anxiety, persistent bad feelings about oneself and life in general are draining, unhelpful and most importantly, not your fault. If you have been struggling with depression, know that there is something that can be done about it. 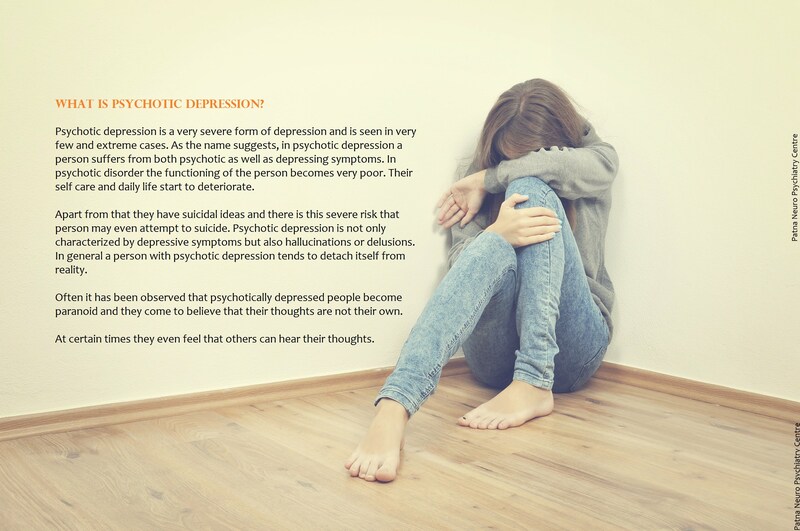 Depression varies in severity & precise pattern from person to person, but there are common symptoms that neuropsychiatrist can easily identify. Sometime depression is an overused term. People may say they 'feel depressed' when referring to a passing low mood; at the end of a holiday or after festival for instance. However, actually being depressed in the clinical sense is something quite different. Clinical Depression (Major Depressive Disorder) can be incredibly debilitating. It can affect a person physically, mentally and emotionally. It can drain your energy, making it literally difficult to get out of bed. It can get in the way of your ability to work, sleep, and enjoy close relationships. It is real, and quite complex. It is not something you 'choose' to have, nor something you can simply 'snap out of'. At Our Clinic, We Are Experts In Handling This Condition With the right help, you can feel better. With the right help, you can feel better. SYMPTOMS OF DEPRESSION. AM I DEPRESSED ? It can be difficult to identify when you are suffering with Depression because the condition lowers self-esteem and feelings of confidence in your own judgment. Ironically, you may be more likely to think you ' re ' making a fuss about nothing ' at a time when you most need help. To assist you, we've listed some of the common symptoms of Depression here. Though remember, Depression affects different people in different ways. You most probably won ' t have experienced all of these symptoms. On the other hand, you may have suffered other symptoms not included on the list. 3. Feel difficulty in connecting, enjoying & spending time with people, even those closest to you. Sometimes Depression sufferers can even lose their ability to feel love for family and friends. 4. Suffer with anxiety. This can be extremely troubling, sometimes even more so than the low mood. It can at times make everyday activities almost impossible. 5. Have problems with your appetite. Many people struggle to eat enough when they are depressed. Or others may comfort eat to try to counteract negative emotions. Depression is also bad for physical health. We know, for example, that the risk of suffering a heart attack, or some other serious medical problem, is significantly increased by the presence of depression. To make matters even more challenging, depression is a condition which is often misunderstood. Sometimes even the people who love you the most don ' t understand why you ' re feeling so bad. They may wonder why you don ' t seem to want to socialize, or you may be slow to get in touch. They may even become frustrated. Sadly, this can leave a sufferer feeling even more alone, and with a heightened sense of guilt. Many people think depression affect only mind & literally it mean you are low or sad. People suffering from depression feel pain or other physical symptoms. Feelings of hopelessness and sadness are common signs of depression. But, these are only emotional symptoms of depression. Depression can cause physical symptoms, too. In fact, many people suffering from depression presents with pain or other bodily symptoms rather than sad & suicidal thoughts . Take a look at the physical symptoms associated with depression. Headaches are quite common in depressed people. Neuroscientist have been conducting studies to further determine the relationship between depression and migraine headaches. If you had migraine, attacks of headache may become more frequent & worse with depressive phase. But mostly headaches associated with depression are called tension type headache (TTH) because such headache have definite temporal relation with stress & strain of daily life. Most of the studies comparing normal individuals with persons who are depressed reveals that those who suffer from depression are four times likely to develop intense or disabling neck and low back pain than those who are not depressed. If you've been dealing with back pain for quite long time, it can be due to depression instead of local anomalies in head & back bone. Chest pain is often a symptom of something related to the heart. Depression can also cause chest pain. Hyper acidity due to excessive worries & panic like attacks with a sense of smothering can lead to chest pain that mimic heart attacks. Unexplained muscle aches and joint pain is one of the ways depression manifests. If you've been struggling with chronic pains, depression can make them worse. Often such person suffering from diffuse muscle pain, low back pain, joint pain etc. undergoes treatment for years with pain relieving medication. Even on intense examination, test & investigations, no orthopaedics or rheumatologic cause can found. Consider depression if you are suffering from diffuse body pain of long duration without any positive investigation finding & relief from past treatment. Depression can make one feel queasy or nauseous. According to a study in the General Hospital Psychiatry, nausea complaints are three times more likely because of anxiety disorder and one-and-a-half times more likely in depression people. A depressed person might have diarrhoea or become chronically constipated. Studies have found that those who are depressed are more than four times likely to develop unexplained fatigue, and those who suffer from fatigue are nearly three times likely to become depressed. No matter how much you sleep, you may still feel lethargic when you are depressed. Those who are depressed can't sleep well � they wake up too early or can't fall asleep when they go to bed. If your sleeping problems linger beyond a week, there could be an emotional condition responsible for it. Depression can cause speech changes; voice can become very slow and spoken in a very low voice. One may have to strain to hear or a depressed person might talk at the top speed, each word tripping over the other. Food is often used by someone to deal with emotional stress and feelings of sadness. Some crave certain foods - like carbohydrates - and put on weight, while others lose appetite and end up losing weight. The Sad Truth About Antidepressant ? Antidepressants today are taken regardless of the need. This careless usage can harm a person ' s physical and mental health. It is difficult to determine if you really need an antidepressant and if you want to start taking it, contemplate on the following factors first. 1. Do you really need antidepressant? 2. Who actually need antidepressant? Many people find relief just in the thought of popping a pill before the medication even starts working. They may even feel heeled if given a sugar candy labelled as antidepressants. If you belong to this category, it means you long for getting soothed. It is better to fulfill these needs in the real world than depend upon a chemical. Generally people believe children to be too young to get depressed. However, the fact is that depression is quite common in children than thought. The manifestation in children remains different from that of adults. You can't expect that a child suffering from depression will say that I am having low mood. Instead, certain behavioral & physical changes can be noticed. 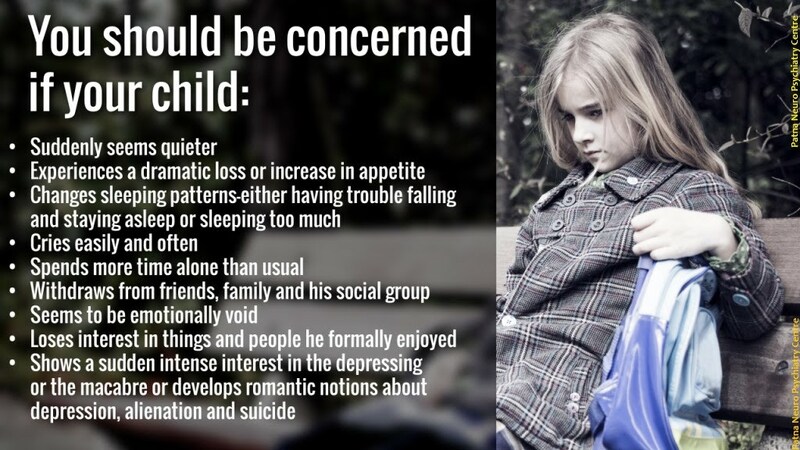 Also the predisposing factors leading to depression in children are different from those of adult. A child suffering from depression may shows listlessness, poor academic performance, crying spells without any reason, poor interest in food, little participation in normal childhood plays etc. Please don't expect a child suffering from depression will complain of depressive symptomatology. It is the sole responsibility of guardians & teacher to suspect depression can be the reason behind behavioural changes of your kid.